The Patience Tester is a treasure in Pikmin 2 and is actually a can of Sun Luck water chestnuts. It is found on Sublevel 3 of the Citadel of Spiders, and is usually hidden in an alcove, sometimes blocked by a wall. There are a few Anode Beetles and Swooping Snitchbugs that may hinder the Pikmin when recovering the treasure. In the European version, it is located it the Hole of Heroes inside the Fiery Bulblax. Exclusively in the US Wii version of the game, Olimar's journal on this treasure contains a copy of the GameCube European text for the Permanent Container, which is one of the European-exclusive treasures characterized with descriptions with written mistakes. The Patience Tester being analyzed. Texture used for the treasure. 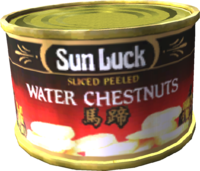 A can of Sun Luck water chestnuts in real life. German Geduldstester Written "Gedulds-tester" in-game. This page was last edited on February 16, 2019, at 15:29.